The Mobile Market, in operation since is pilot season in 2012, is a farmstand on wheels that brings fresh produce from Connecticut farms directly to New Haven neighborhoods. The Mobile Market visits neighborhoods in New Haven that might not have access to a farmers market or grocery store, including housing authority and senior living sites, during the Summer months. Common Ground supplies the Mobile Market with fresh produce grown on their farm and other regional farms, as well as student workers from our Green Jobs Corps Program, a youth employment and leadership development program that links students with meaningful, paid work. Community members and our partners make the Market a vibrant part of their neighborhood in the Summer, enjoying cooking demonstrations, greeting other regular shoppers and buying fresh healthy food for their families. 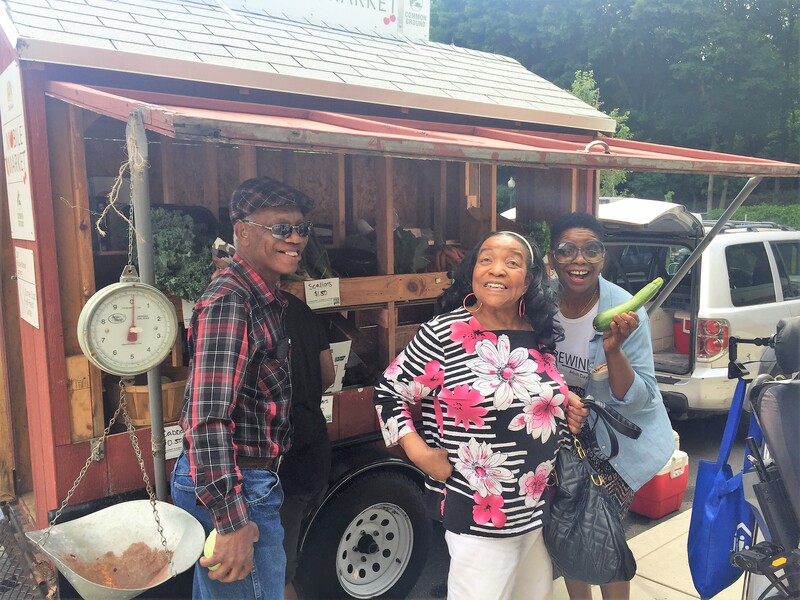 Mobile Market Patrons enjoy fresh food close to home! Shelton Ave and Hazel Ave.